Sometimes, though, I can’t remember if something was a dream or real life. Luckily those lines don’t blur too much, or in potentially awkward ways, but this week I keep remember some tips on singing karaoke — something I’ve never done — and can’t remember if it’s from real life or a dream! Either way, I remember getting three tips: 1) know the lyrics beforehand, 2) PRACTICE, 3) Consider how the song makes the audience FEEL. As I type this I’m getting more and more certain that it was a dream, because I remember being on stage and not being able to open my eyes (a common problem in my dreams: lack of vision) and therefore TOTALLY botching it. Back to the tips: NUMBER THREE IS GENIUS! Good job, subconscious! Seriously, you could pick your favorite song, but if nobody else likes it … meh. Karaoke is a performance, so taking your audience into consideration — and choosing a song that’ll make them engage and feel something — is essential! I realize this is a totally weird thing to be talking/thinking about, but I figured I’d pass along my life-changing (eeeeh) realization in case you’re about to throw down some karaoke. Anyone? Anyone? GOOD LUCK. 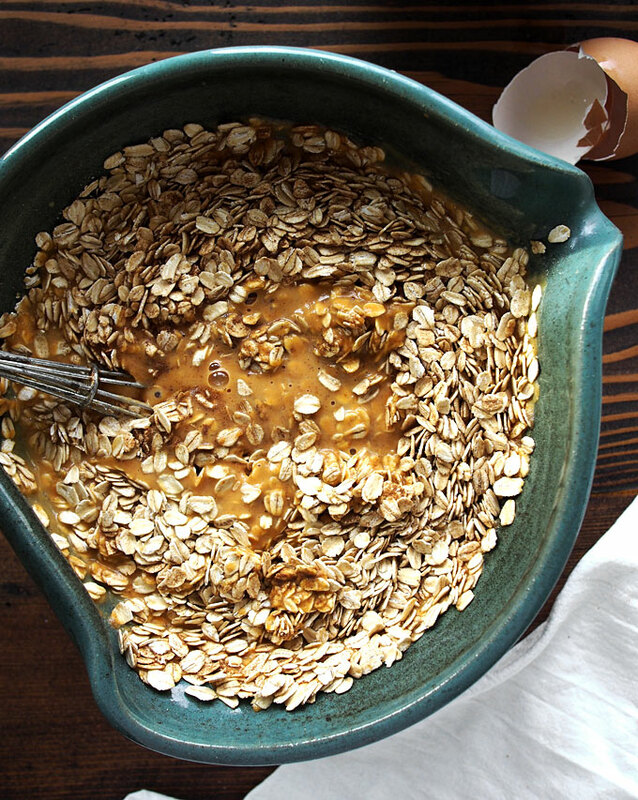 I’m really here to tell you about this oatmeal, though. 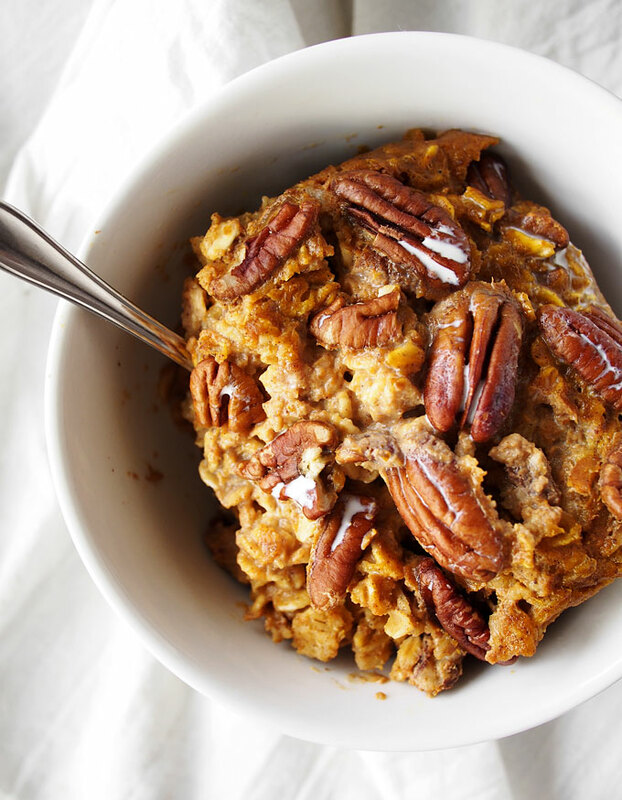 Baked oatmeal is something I discovered this year and am ALL OVER! It’s so darn easy. And delicious. And you can make it ahead of time and then eat it all week! I’m in charge of our inaugural Thanksgiving brunch next week (dinner is later than usual, so we decided we needed some food earlier in the day! 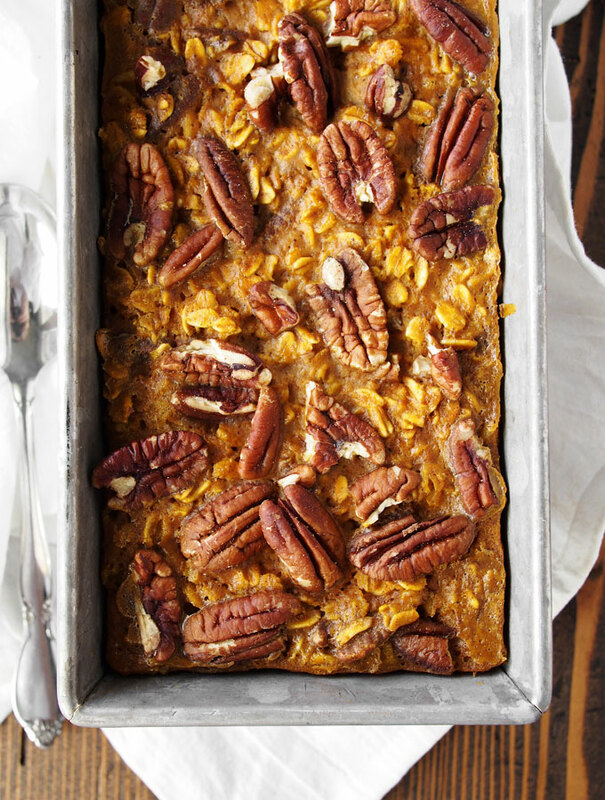 ), and I fully plan to include some baked oatmeal! 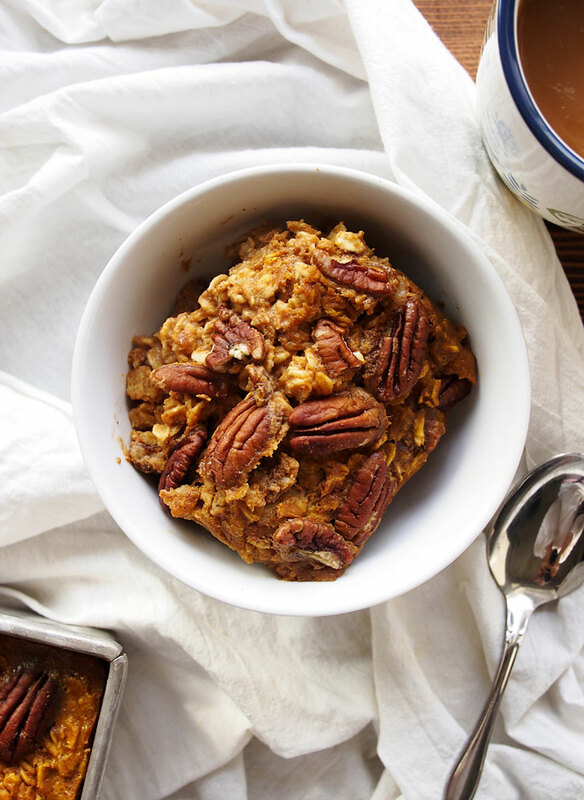 I’m leaning towards going with this one, since we’ll have plenty of pumpkin, but have been loving this baked pumpkin spice oatmeal in the meantime! Also, it’s a super sneaky way of eating veggies for breakfast. Not that I really need to sneak veggies into my breakfasts (have you seen my instagram? #vegfordays), but in case you have a #veghater … get on this. Preheat the oven to 350F. Butter an 8×8″ baking dish, or a 9″ loaf tin. Combine the brown sugar, salt, milk, pumpkin puree, egg, melted butter, and vanilla extract. Whisk until smooth. 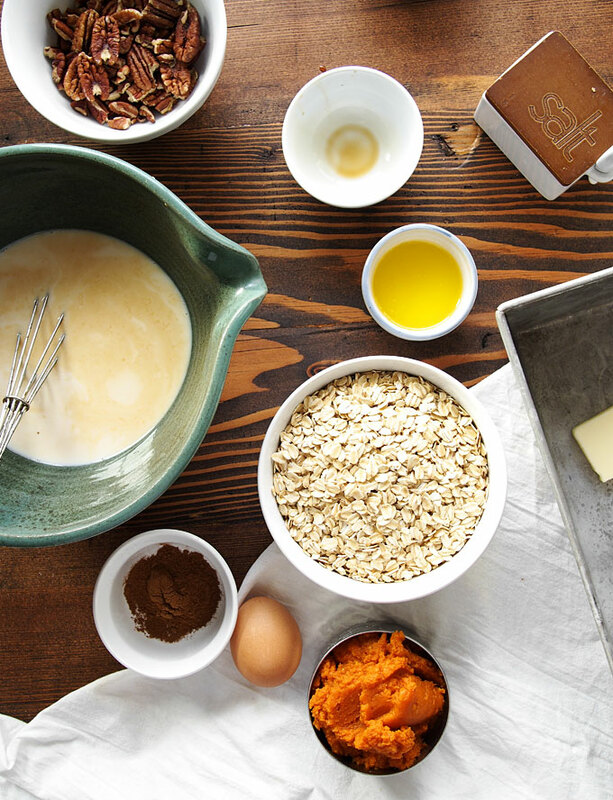 In a separate bowl, mix together the oats and pumpkin pie spice. Once mixed, add to the wet mixture and stir to combine. Fold in the chopped pecans. 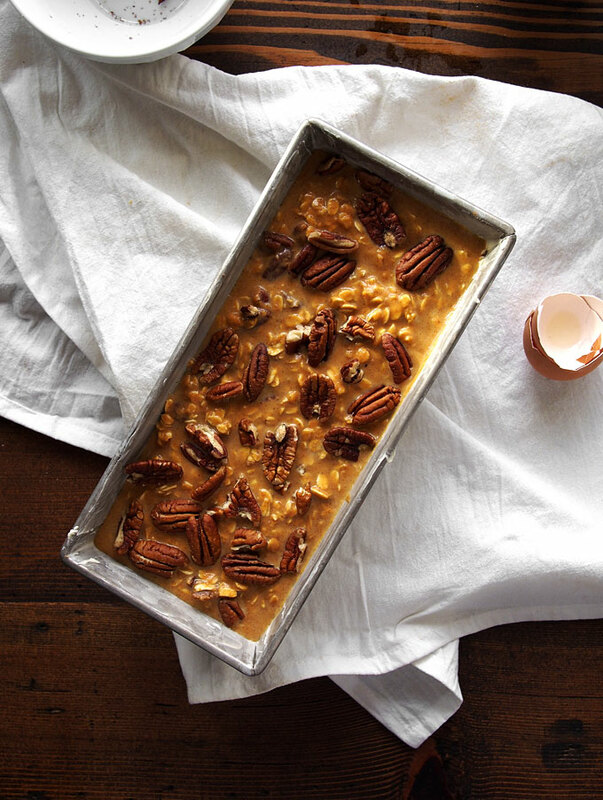 Pour into the prepared dish, and top with the remaining pecans. Bake for 45-50 minutes. The mixture should be set and beginning to turn golden on top. Serve with half & half or yogurt. 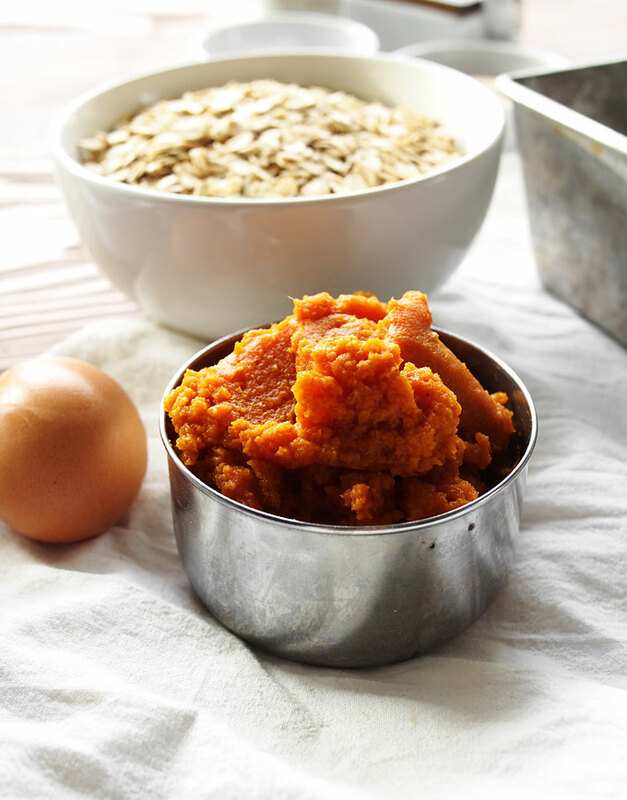 This breakfast is perfect for the weekend! l love that it’s baked! Yummy! I made this and cooked it in a muffin pan. I had one for breakfast and now have 5 more for this week. I added some cranberries and chopped ginger for an extra bang. Love it! Yum! Cranberries and ginger sound like a great addition! I usually shy away from any recipe using a partial can of pumpkin but decided to try this anyway and loved it! It’s fun to eat something different for breakfast and this is delicious. I made it in an 8×8 pan and cut it into 6 pieces. I warm it in the microwave for about 30 seconds – one day I poured on some almond milk and another I used yogurt. I lied both but preferred the yogurt.